In my locale I seem to be surrounded by roses…the Rose City, Rose Parade, Rose Bowl, Rose Tea Room, references to roses everywhere, even outside my window there currently is a quiet riot of roses exploding in my garden, which reminds me of a little sweet Bijouxs – Moroccan Dates with Rose Syrup – everything is coming up roses at Bijouxs. Roses are prominent culturally, historically, and heavily referenced in literature but roses also play an important role in cuisine as well. The rose is vital in Moroccan culture and cuisine. Roses are seen everywhere in the marketplace and meals may be concluded with delicate ornate shakers of rose water offered to freshen hands after a meal. My favorite variety of rose for cuisine is rose syrup. 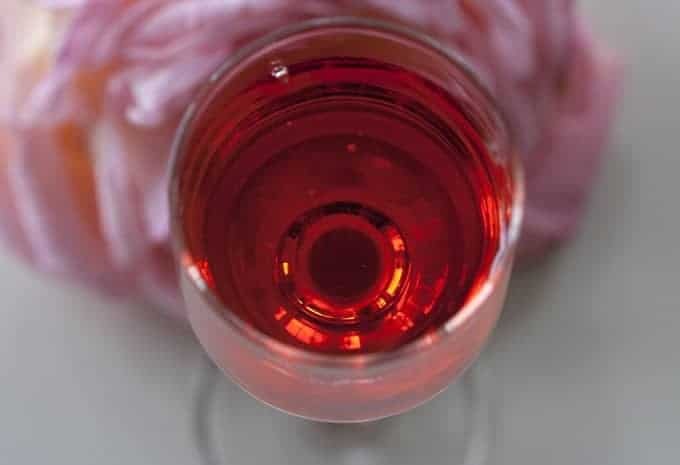 It may sound a bit strange, perhaps an acquired taste, but rose syrup is not too sweet, with just a hint of rose essence, a beautiful deep pink liquid – a Bijouxs to have in your pantry. Rose syrup may be found online and also in markets that specialize in products used in preparing Middle Eastern cuisine. 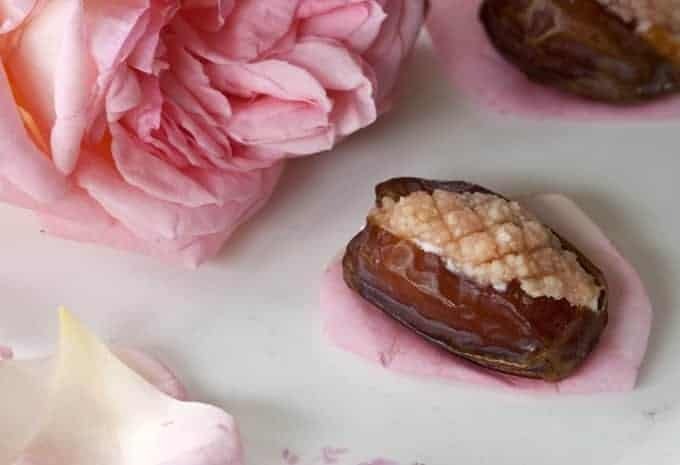 These sweet Moroccan Dates utilize rose syrup, my version of classic stuffed dates that are served in Morocco, usually to guests and for special occasions. These are a no-cook, easy confectionary, sweet and slightly exotic in flavor. 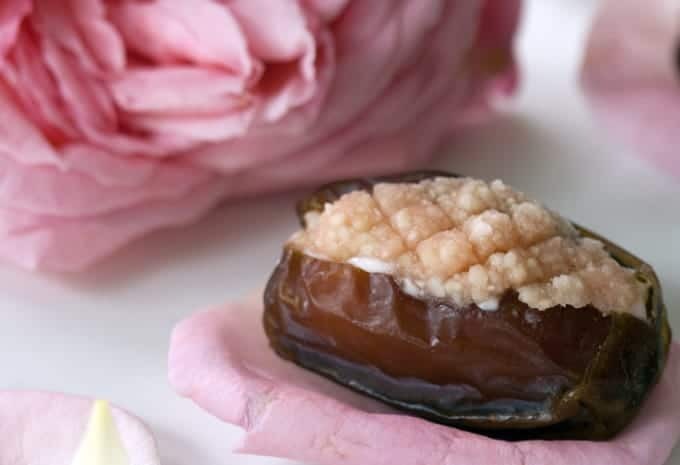 Pitted dates are stuffed first with a layer of yogurt flavored with rose syrup and honey; next the dates are topped with a “marzipan” of sorts – almonds finely ground and mixed with the rose syrup to create a pink, candy-like cap on the dates. Chill the dates for about 2 hours before serving to allow time for the yogurt filling to set. Place each date on an individual rose petal – guests are left with the lovely hint of rose after they enjoy the sweet date candy. These dates are exotic little jewels that pair nicely as a finish to any Moroccan menu and are fun to add as a sweet to a tea menu, or as a little jewel anytime. Everything is coming up roses at Bijouxs. 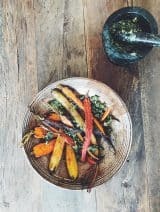 gorgeous little bites–wouldn’t these be perfect for the hollywood bowl? 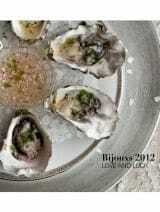 a nice breezy Moroccan themed bijouxs bites evening? i have used rose syrup and water in sweets, but never in something as elegant as this. simply you! Hi Christy! Oh, I love your idea of packing the dates as dessert for a Hollywood Bowl menu – it’s a Bijouxs! Thank you! Breathtakingly beautiful image, and a sweet education for me. Knew about rose water as a flavoring for cakes and other sweets in early American kitchens, along with orange flower water. But I had never heard of rose syrup, and am getting myself a bottle pronto. I grew up on stuffed dates as a Christmas treat, filled with simple confectioner’s sugar/butter fondant and a pecan on top. You’ve got me curious and inspired to sleuth out more. Nancy, you may be on to another Bijouxs… maybe infuse a little rose syrup to your filling and top with pistachio praline? Let me know what Bijouxs you create! Thanks for being a part of Bijouxs. These photos are pure art! Simply gorgeous. 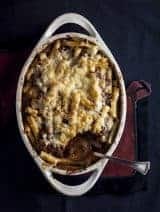 I can’t wait to give this recipe a try sometime! Great meeting you at Camp Blogaway last weekend. 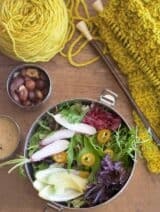 I look forward to following your blog for more of these fantastic recipes! Hello Kristina – Such a pleasure to meet you too and I love your site! Thank you for checking in at Bijouxs!